In one of the largest organized marches in the history of the world, tens of millions of Shia Muslims made an incredibly heartening statement, by risking their lives to travel through war-stricken areas to openly defy ISIS. This massive event that would have undoubtedly helped to ease tensions in the West was almost entirely ignored by corporate media. Women, men, elderly, and children made their way to the city of Karbala on Sunday and Monday last week for the holy day of Arbaeen. Arbaeen is the event which marks the end of the 40-day mourning period following Ashura, the religious ritual that commemorates the death of the Prophet Mohammad’s grandson Imam Hussein in 680 AD. 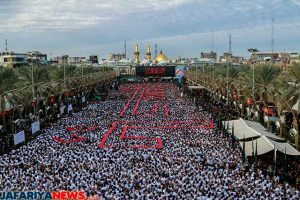 As the Independent reports, massive crowds paid homage to the shrines of Imam Hussein and his half-brother Abbas in Karbala, where they were killed in a revolt against the Umayyad ruler Yazeed in the 7th century AD when they refused to pledge allegiance to Yazeed’s Umayyad caliphate. Registering only as a blip on the Independent, this most amazing feat was conducted in spite of ISIS, as well as the sacred annual pilgrimage. As the UK paper notes, the march comes as nearly 80 people, many of them pilgrims returning from commemorating Arbaeen in Karbala, were killed in the latest Isis attack in the area. Isis has declared Shia Muslims apostates and targeted them in its bloody campaign to establish a hardline caliphate across Iraq and Syria, according to the Independent. The brave men, women, and children marched on, knowing that an ISIS suicide bomber had just struck near Karbala the week prior. In recent years, this march has taken on a dual purpose. 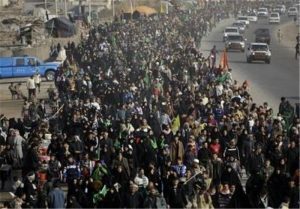 Where it was once a march for Arbaeen, it now also encompasses the Shia resistance and protest against ISIS terrorists. “I came walking from Basra with my wife and three sons … This is the third time. We started walking 13 days ago and reached Karbala on Sunday night,” said Pilgrim Jaber Kadhem Khalif. According to the Independent, the 40-year-old said his prayers would go to the Hashed al-Shaabi paramilitary group that has tens of thousands of men deployed on the front lines to fight ISIS. Umm Ali, who came without her husband, as he is currently fighting ISIS on the front lines, said, “I came with my son and two daughters. I came from Samawa to Najaf by car, then from Najaf to Karbala on foot, to make a plea for my husband’s safety. In spite of this pilgrimage being one of the most massive marches in the world, the West conveniently ignored it. Arbaeen is magnitudes larger than the Hajj pilgrimage to Mecca — yet Mecca is the only event that ever receives headlines in the West. Given the recent revelation that the Shia Muslims are also marching against Daesh, one can’t help but wonder why this isn’t all over American news. 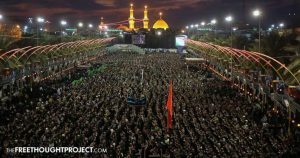 According to the Independent, organizers of the annual Arbaeen procession in U.K. have previously spoken of their frustration over the lack of mainstream media coverage of the event. “Unfortunately [some] media outlets have gone for stories that to some extent can be divisive. If a group of Muslims does something good, it’s not mentioned or the religion is not mentioned. But if someone does something [negative], it is on the front page and their religion is mentioned,” Mohammed Al-Sharifi, a volunteer at last year’s event told the Independent. Many of the stories on Muslims in the U.S. that make it on to the mainstream are those that stoke divide. When a Muslim hero saves hundreds of lives by jumping on a bomb — which actually happened in July — the mainstream and the Islamophobic alternative media is mum. Those who would judge 1.6 billion people by the actions of just a few are creating a narrative in which innocent lives are put in danger. Throughout history, most mainstream religions have perpetuated extreme violence upon the world. To attempt to paint Islam as the problem is no better than labeling all Catholics murders for the inquisition. But peace and empathy are enemies to the establishment who need you to hate others. When the establishment can paint things as black and white, it is easier for you to be controlled. Consequently, this is the exact mission of ISIS. As the Free Thought Project’s Jay Syrmopolous points out, if there is one thing that Islamic fundamentalists and Islamophobic fascists agree on, it’s that there should be no “gray zone;” only black and white. The gray zone is the zone of peaceful coexistence. Eliminating the gray zone – and rendering a world as black & white as the flag of the Islamic state is the ultimate goal of fundamentalists on all sides. In fact, a recent ISIS publication, titled Extinction of the Grayzone made clear that the strategy has been at play for the past 14 years. The way to truly defeat ISIS is by rendering their fear and divisive tactics impotent. We need to show ISIS, and those being manipulated by their tactics, that tolerance and freedom are far more powerful than bigotry and hate — which is why, coincidentally, not a single American mainstream outlet reported on the tens of millions of Muslims marching against ISIS. Please share this story with your friends and family who may find themselves subject to the fear mongering in the media of Muslim violence. You can bow down to the will of ISIS by allowing their hate-filled rhetoric and divisive tactics to cloud your mind with fear and hatred. Or, you can rise up and stand against those who would drive a wedge through the heart of humankind. The choice is yours. UPDATE: We’ve received plenty of backlash from folks who are denying the anti-ISIS sentiment in this march and we’d like to clarify our point. No one is denying that this is an annual pilgrimage that is centuries old. In fact, if you read the article, that is clearly explained. That being said, we understand how the original title: 20 Million Muslims March Against ISIS and The Mainstream Media Completely Ignores It, can be misconstrued as implying the entire march was planned in opposition to ISIS, which is not the case. We have updated the title to better reflect the sentiment of this article — which, coincidentally, is exactly the same. Historic Speech in Damascus SENDS “SHOCKWAVES” Around the World!!! Is Obama Telling Illegals Not To Worry About Getting Caught If They Vote? Simultaneous Notre Dame/Al-Aqsa Fires: Mere Coincidence or Conspiracy?